The last time I visited my mother she gave me a brand new ceramic tea pot. Being the tea-swilling anglophile that I am, I was thrilled with my new gift. I've been wanting a ceramic teapot for a while so I could crochet a fun little tea cozy. 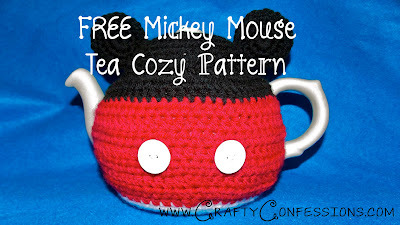 I made a plain blue cozy to start with to get a pattern down for my pot, then branched out to this Mickey Mouse cozy. I wrote the pattern as I went, but did not take pictures of the process. I tried to make this pattern as clear and easy to read as possible, but if you have any questions just leave a comment. My pot is a 36 oz. teapot. If yours is smaller you may need to modify the patten a bit. **Just a quick note before we start: PLEASE PLEASE PLEASE don't sell this patten. I worked really hard on it and it would really hurt my feelings if someone sold it as their own. That being said, feel free to sell the finished product. You put in the work so you should be able to do whatever you want with it. With WHITE Ch 7 and join with a slip stitch in the 7th ch from the hook. This will be the button loop to close your pot later. Continuing from the loop ch 47. This should wrap around the base of your teapot and stop just at the sides of the handle. Row 2: Ch 1. Turn. *2 HDC in first stitch and 1 HDC in the next 8 stitches. Repeat across. (50). Fold in half and mark the center stitch—should be the 33rd stitch. This next part will create the hole for the spout. Row 6, Side 1: Starting at the end of row 5 Ch 1. Turn. HDC in next 30 stitches. Row 7, Side 1: Ch 1. Turn and HDC in each of the 30 stitches across. Rows 8-10, Side 1: Repeat next three rows for a total of 5 rows of 30. Fasten off. Starting on opposite side count 30 stitches in and slip stitch on the 30th stitch. Row 6, Side 2: Ch 1. HDC in same stitch and in each stitch across to the end for a total of 30 stitches. Row 7, Side 2: Ch 1. Turn and HDC in each stitch across. Row 8-10, Side 2: Repeat for the next 3 rows for a total of 5 rows of 30. Fasten off. You can see here how the opening for the spout will look when finished. With BLACK slst into last stitch. Row 14: Ch 1. Turn. HDC into every other stitch across. Sl st into first stitch of the row creating a round. Ch 1. You can see here where the rows end and the rounds begin. Round 15: HDC in each stitch around. Join. Ch 1. Round 16: HDC in each stitch around. Join. Ch 1. Round 17: Skipping the first stitch HDC in second and third stitch. *Skip a stitch and HDC in the next 2 stitches. Continue around (Instead of skipping a stitch you could also 2 hdctog (half double crochet together). Join. Ch 1. Round 18: HDC in each stitch around. Join. Ch 1. Round 19: Skipping the first stitch HDC in second and third stitch. *Skip a stitch and HDC in the next 2 stitches. Continue around (Instead of skipping a stitch you could also 2 hdctog). Join. Ch 1. Round 20: HDC in each stitch around. Join. Fasten off. Weave in the ends. Attach the medium white button to the bottom of the cozy across from the button loop. Sew the large white buttons to the middle of the red patch on your cozy. These are Mickey's pant buttons. With BLACK ch 5. Join. Round 3: Ch 1. *2 sc in first stitch, 1 sc in the next stitch. Continue around. Fasten off, leaving a long enough tail to sew the ears to your cozy. Weave in the ends of the middle thread. Sew the ears to the sides of the cozy on either side of the pot lid. Note: If you are modifying this pattern to fit the size of your teapot make sure you fit the cozy with the teapot lid ON. This cozy is all one piece. This pattern is versatile and can be used with just one color or as many as you want to make any kind of basic teapot cozy. I hope you enjoy this pattern as much as I enjoyed making it. It is really the first pattern I have written, so please excuse any mistakes and please let me know if they are there so I can fix them. I'm sharing this on my FB page so all my friends can see it.